I've been wrapping my brain around becoming the person I used to b*(*h about. I finally have a solid answer to what I would do with the money if I won a lottery full of money. Hey y'all! 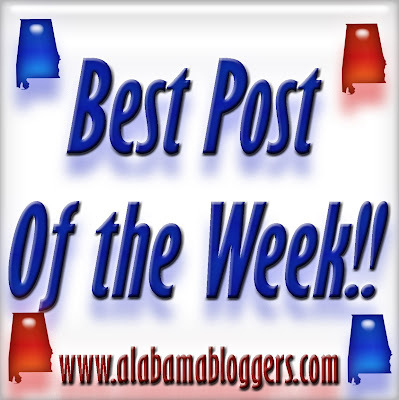 This is my first linky here at Alabama Bloggers. Glad to have found you guys. My best post of the week is an easy tutorial on making a chevron tote bag. I chose it as my best because I've really enjoyed my new bag and the colors make me smile. :) Have a great week! Thanks for this forum. I'll learn the correct way to "LINK" soon. I am excited to be joining this link up. I am sharing our master bedroom reveal. We just finished painting, adding some fixtures, and moving the furniture around. Birmingham Restaurant Week: The Fish Market. Birmingham Restaurant Week: Nabeel's Cafe. Birmingham Restaurant Week: A Photojournal. Birmingham Restaurant Week: Chart Your Course.